Polson First Interstate Bank staff pose with PYSA Board Members on the First Interstate Bank field. 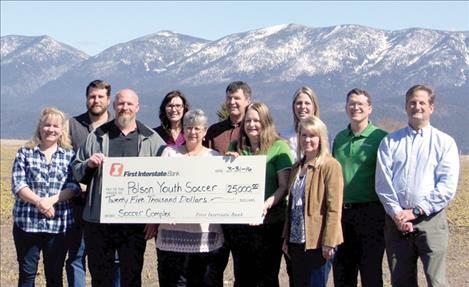 POLSON — Polson Youth Soccer Association is thrilled to announce that First Interstate Bank is sponsoring one of the four regulation-sized fields at the brand new soccer complex north of Mission Valley Aquatics. The central/east soccer field will be named the “First Interstate Bank” field in recognition of the $25,000 donation given by the Polson Branch of First Interstate Bank and the First Interstate BancSystem Foundation. The Foundation has supported countless non-profits, including area schools and hospitals, Boys and Girls Club, Flathead Lake International Cinemafest, Mission Valley Live, and the list goes on. Hupka, who is a volunteer coach for PYSA and has two children involved in the program, is acutely aware of the benefits of having a community soccer complex. With the help of First Interstate Bank’s generous donation, PYSA is well on its way to completion of the soccer complex, and has raised approximately 75 percent of the necessary funds. Much of the infrastructure, including grading and installing irrigation, was done last year. Fields are currently being sprayed and hydro seeded by Alpine Landscape and Design. PYSA encourages everyone to drive up to the fields and watch them “green up” this spring and summer. Construction of the concession stand/restroom/information center is scheduled to begin in the next few months. Although PYSA is close to its financial goal, raising the remaining funds to complete the project is critical, and time is of the essence. As an established 501c3 organization, PYSA welcomes financial or in-kind donations. Please contact Sarah Beck Smith at 406-261-0641 if you are interesting in helping them complete this meaningful project. PYSA thanks First Interstate Bank not only for its generous support of the soccer complex, but for giving back and being involved in the community. PYSA is honored to carry forth the mission of the First Interstate BancSystem Foundation.